Gulf Harbour Radio uses the two tracking site pages to see where boats are, and to check that the actual conditions you are reporting match up with the models David is looking at. Many of you have your own blogs but we have only time each morning to look at the two web sites that many use. Please make sure your boat and crew data is accurate and in the case of emergency have a contact number. Already this 2019 season two boats have made use of emergency services so it speeds things up to have this information available. www.cruisersat.net is run by Kostya on SV Ponyo. Make sure you join the Gulf Harbour Radio SW Pacific group . There are good clear instructions to follow but if you have any problems contact him at kostya.marchenko@gmail.com. www.yit.nz is run by Mike on SV Mirabilis. Contact mike@yit.nz if you have any problems. The detailed personal information is only available to the web managers and Gulf Harour Radio and is used when emergencies occur and we need to communicate with NZ Maritime Radio or the RCC - Rescue Coordination Centre. David needs boat information to better answer weather requests - a 60' catamaran will travel faster than a 30' monohull!. In June 2016 the 20m monohull yacht Platino on passage from NZ to Fiji ran into problems and two crew lost their lives. The report from Maritime NZ is very extensive and much can be learned from it. In the past couple of years boats have had problems trying to extend their stay in Tonga. Immigration has a clear process for crew and a stay of up to six months is possible. However a boat only gets 4 months on entry so a process needs to be followed with Customs. This is detailed in Flotsam and the key person in Tonga for all yacht related correspondence is Mr Felefonum Mapakaitolo. May 15, 2018 sees the new requirements for boats entering NZ come into force. Hulls need to be clean and an approved bottom paint used. See www.yit.nz/Forum for details and read the MPI publications. 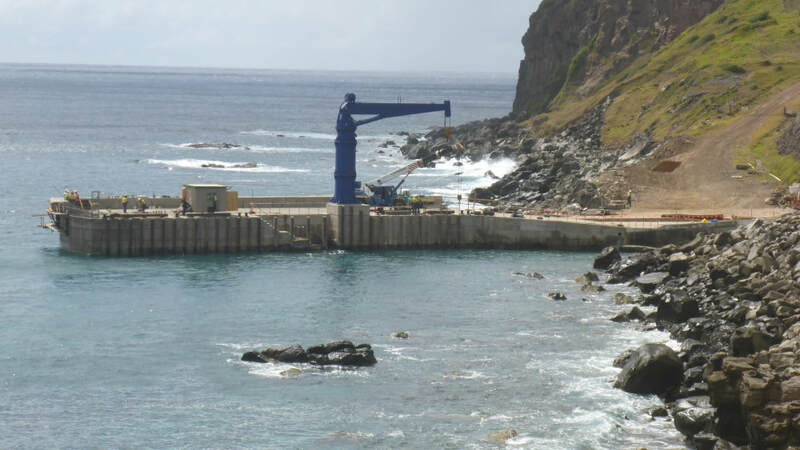 Norfolk Island has finally opened their new dock at Cascade Bay. Previously cruisers had to use the dock at the main port of entry in Historic Kingston. Situated in the south of the island Kingston is rather turbulent in some weather conditions! The new dock at Cascade on the east of the island gives cruisers an option when there is a sou' wester blowing. And it enables you to get ashore more easily from this anchorage. It is a ways from town but normally passing vehicles will usually offer a lift. ​Thanks Ashley for the photograph - taken March 2018.